City Connect celebrates the anniversary of the birth of John Lennon who was born on this day in 1940. Lennon rose to worldwide fame as one of the founding members of The Beatles, one of the most commercially successful and critically acclaimed acts in the history of popular music. Along with fellow Beatle Paul McCartney, he formed one of the most successful songwriting partnerships of the 20th century. Born and raised in Liverpool, Lennon became involved in the skiffle craze as a teenager, forming his first band, The Quarrymen evolving into The Beatles in 1960. Lennon marriage to his first wife Cynthia Powell began just as Beatlemania took hold across the UK. He performed on the evening of his wedding day, and would continue to do so almost daily from then on. Their son Julian was born on 8 April 1963. Cynthia attributes the start of the marriage breakdown to LSD, and as a result, she felt that Lennon slowly lost interest in her. Following his affair with Yoko Ono, Lennon and Cynthia divorced with Lennon giving her £100,000 and custody of Julian. As the Beatles disintegrated towards the end of the 60s, Lennon embarked on a solo career that produced the critically acclaimed albums John Lennon/Plastic Ono Band and Imagine, and iconic songs such as “Give Peace a Chance” and “Imagine”. Lennon revealed a rebellious nature and acerbic wit in his music, his writing, his drawings, on film, and in interviews, becoming controversial through his political and peace activism. After his marriage to Yoko Ono in 1969, he changed his name to John Ono Lennon. He moved to New York City in 1971, where his criticism of the Vietnam War resulted in a lengthy attempt by Richard Nixon’s administration to deport him, while his songs were adopted as anthems by the anti-war movement. Lennon disengaged himself from the music business in 1975 on Ono’s request for him to become a househusband and he devoted the next five years to looking after his infant son Sean. Lennon re-emerged in 1980 with a new album, Double Fantasy. Three weeks after the release of this album, Lennon was murdered. At around 10:50 pm on 8 December 1980, as Lennon and Ono returned to their New York apartment in The Dakota, Mark David Chapman shot Lennon in the back four times at the entrance to the building. Lennon was taken to the emergency room of nearby Roosevelt Hospital and was pronounced dead on arrival at 11:07 pm. Earlier that evening, Lennon had autographed a copy of Double Fantasy for Chapman. Music historians Schinder and Schwartz, writing of the transformation in popular music styles that took place between the 1950s and the 1960s, say that The Beatles’ influence cannot be overstated: having “revolutionized the sound, style, and attitude of popular music and opened rock and roll’s doors to a tidal wave of British rock acts”, the group then “spent the rest of the 1960s expanding rock’s stylistic frontiers”. Liam Gallagher, his group Oasis among the many who acknowledge the band’s influence, identifies Lennon as a hero; in 1999 he named his first child Lennon Gallagher in tribute. On National Poetry Day in 1999, after conducting a poll to identify the UK’s favourite song lyric, the BBC announced “Imagine” the winner. Lennon continues to be mourned throughout the world and has been the subject of numerous memorials and tributes. In 2010, on what would have been Lennon’s 70th birthday, the John Lennon Peace Monument was unveiled in Chavasse Park, Liverpool, by Cynthia and Julian Lennon. The sculpture entitled ‘Peace & Harmony’ exhibits peace symbols and carries the inscription “Peace on Earth for the Conservation of Life · In Honour of John Lennon 1940–1980”. The Lennon/McCartney songwriting partnership is regarded as one of the most influential and successful of the 20th century. He was appointed Member of the Order of the British Empire (MBE) with the other Beatles in 1965. Lennon was posthumously inducted into the Songwriters Hall of Fame in 1987 and into the Rock and Roll Hall of Fame in 1994. In 2002, a BBC poll on the 100 Greatest Britons voted him eighth. 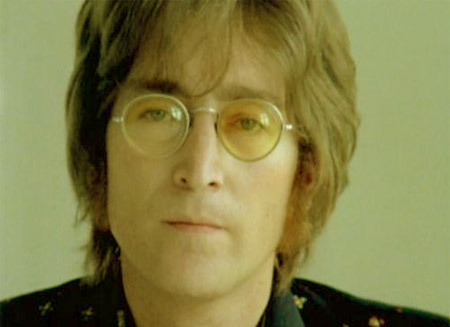 Between 2003 and 2008, Rolling Stone recognised Lennon in several reviews of artists and music, ranking him fifth of “100 Greatest Singers of All Time” and 38th of “The Immortals: The Fifty Greatest Artists of All Time”, and his albums John Lennon/Plastic Ono Band and Imagine, 22nd and 76th respectively of “The RS 500 Greatest Albums of All Time”. As of 2010, Lennon’s solo album sales in the United States exceed 14 million units, and as writer, co-writer or performer, he is responsible for 25 number-one singles on the US Hot 100 chart. Tagged birthday, music. Bookmark the permalink.